There is a reason why comfort food is called as such: it’s because every bite comforts a tragic soul, every serving puts the weary heart at ease. Ever wondered why a bowl of your mother’s signature stew or casserole calms you down after a long, tiring day at work? The warm and hearty serving reminds you of home. You are here, at your rightful place in the greater scheme of things. Never mind that you’re in a little corner eating – as long as you find a respite from everything. I’ve arrived to eating as a coping mechanism after a recent breakup. With no one to turn to and not much of a network to help me out, I learned to face my problems alone. Food really does the body and soul good during times like this. Savoring every bite and taking my time to enjoy what’s on my plate, I realize that solitude is never bad as people may seem it to be – even for a short time. No one meddles with or snoops on what you eat, and they learn to steer clear of you. In this triptych, I’d like to share three instances where food satiated both my body and soul. Expect me to wax poetic here. I’ve mentioned countless times in this blog that Toast Box has been my go-to restaurant for Singaporean fare. For this visit, I ordered the Hainanese Chicken Chops Rice and a full Kaya Toast Set with Cold Teh Tarik. I liked the crispy chicken skin that came with the chops, as it was flavorful enough to stand alone as a viand. Occasional sips of the clear soup that came with the meal cleaned the palate for the next bite. I mixed the ginger, chili, and kecap manis (sweet soy sauce) with the rice, with good results. The kaya toast dipped in soft-boiled egg with soy sauce and black pepper, alongside the cold milk tea, capped off my meal with something sweet. Philippine brioche topped with sugar and cheese (locally called ensaymada), paired with hot chocolate, is a classic comfort food dating back from the Spanish era. Cafe Mary Grace brings this timeless pair to a whole new level. The ensaymada has the perfect sweet-salty taste from the cheese and sugar topping. It is best to have the brioche grilled first before eating, so the toppings form a shiny, golden crust. Meanwhile, the hot chocolate is so thick – you could dip churros in it. Despite the consistency, the dark earthy flavor of cacao stands out. What I usually do is add small amounts of water at a time, stirring afterwards. That way, the hot chocolate thins out to a more drinkable consistency. That closes this latest triptych of mine. Until the next post, bon appetit. Omg, you know the phrase of kecap manis. Seems you know a lot about Indonesia. I love kaya toast and teh tarik too! When I don’t want to eat rice at night, I just eat kaya toast. Haha! There is this restaurant here in Marikina called Goreng Goreng and they serve Southeast Asian comfort food, as well. Yummy! It is so good to have few places to go when you crave something cozy and comfy. I also have such places in Ljubljana and it makes decisions on where we want to eat so much easier. Indeed! You should write more about those places! The good thing about Manila is that there’s always something new when it comes to gastronomy. Many thanks for stopping by; ’tis much appreciated! Thank you for visiting The Monching’s Guide! • First and foremost, I highly encourage reading the Blog Policy section. • Check out the five latest entries at the Home area. • Browse the archives per month or per category—or look for certain posts via the search box. • Drop a comment and join in the conversation. 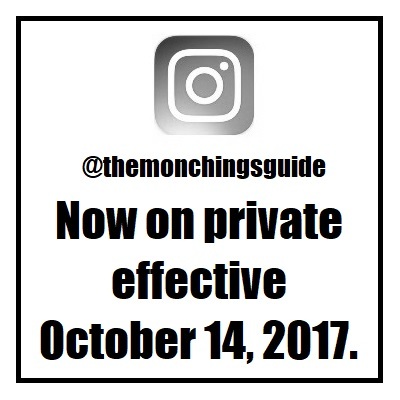 • For collaborations and other inquiries, send me an e-mail at the.monchings.guide@gmail.com. Monch Weller is a pen name and I blog at The Monching's Guide. I'm the most terrible bloke you'll ever meet, but at least I'm bloody honest about it. Send me a direct message on Instagram if you wish to follow. I’ll approve immediately if I know you. Just keeping out the bots and thots, a’ight?